I have probably only seen this version once before recently viewing it for this post. I found it, and one other Hayley Mills movie I remember seeing as a child (The Trouble with Angels) at our local MovieStop, which unfortunately just went out of business. Sad face. But I scooped up these two gems, and I’m very happy to add them to my collection. Normally, with these TVN posts I’ve been doing, I’ve noticed it’s a fresh take on an old movie, so pretty much the only thing the two titles in question share, is the story line. 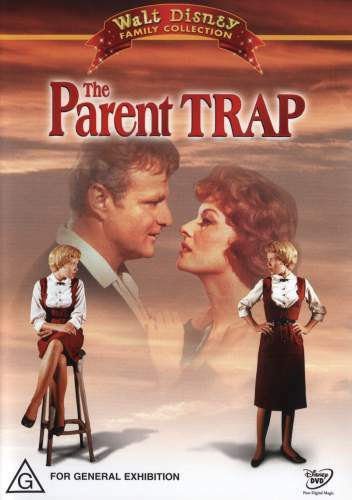 But with The Parent Trap, I was surprised at how much of the original dialogue was inserted into the remake! Now, I haven’t seen the 98 version in years, but I watched it so many times that it’s now ingrained in my brain, and watching the 61 version just threw me for a loop as 98 came rushing back. The opening camp segment especially, is maybe 90% word for word from the original. It’s just blowing my mind. Here the girls are 15-16, which I like for the maturity of their characters. Yet in the remake the girls are 12, which also works in light of their innocence. The pranks they pull on each other at camp are more believable when constructed by a couple of 15-year-olds, but the entire idea of getting their parents back together and hoping they’ll re-fall in love is more akin to a 12-year-old. Ultimately I feel the winner of the “who wore it better?” contest (strictly speaking on age) would have to the 1998 version. This one was one of my childhood favorites. My friends and I probably watched it a millions times, quoting it word for word, so it was no exaggeration when I said this version is ingrained in my brain. It is. I’m kind of shocked I don’t own it, actually. One day I will, and you better believe I’m going to have so much fun watching it again. One thing I really liked more in this version is the accents. In the original version, Mom and Twin #1 live in Boston, while Dad and Twin #2 live in California. Hayley Mills was born in London, so no matter which twin she’s playing, she sounds British. However, in this remake, Mom and Twin #1 live in London, while Dad and Twin #2 still live in California. Lindsay Lohan did an amazing job distinguishing one twin’s sound from the other. She even yells in French at one point! It’s crazy! I remember being told that the original actress from the 1961 film had a cameo in this version. I have finally figured out this is not true, BUT someone else does. The original actress who played the other woman (and I’m using the generic terms because none of the names are the same) plays the other woman’s mother in this version. Little bits of trivia like that is what I live for. It’s just crazy to think about. If you haven’t seen one, or both, check it out, or even if it’s just been a while, find it. The only real difference between the two is that 61 seems to go more in depth with the parents, whereas 98 gives the maid/butler more personality and screen time. Either way, these are both great family fun movies that should be treasured before someone remakes it again. This entry was posted in comedy, family, NR, PG and tagged 1960s, 1990s, Boston, California, Dennis Quaid, Disney, Hayley Mills, Lindsay Lohan, London, Natasha Richardson, remake, summer camp, twins. Bookmark the permalink.